My thanks to Scott Jesser for contributing this 1976 view of North Eton Mill No.1 plinthed at Rockhampton. The wheel spacing and frame design suggests it may have been converted from 0-4-2ST to 0-6-0ST. This locomotive originally ordered for the Double Peak Central Sugar Co. Ltd, North Eton, near Mackay, where it was known as ‘Warrego’. In 1912 it passed to the roster of the North Eton Mill and was renamed ‘Ironside’. I believe it was converted from an original 0-4-2ST design to 0-6-0ST configuration at some stage in its career. 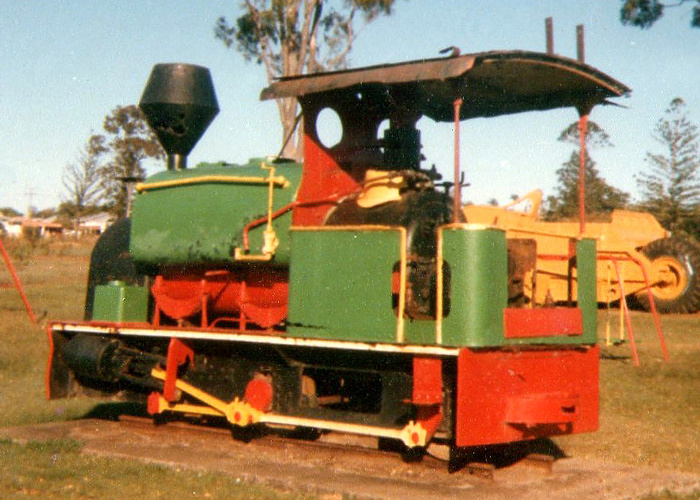 By 1964 North Eton No.1 was out of service and was plinthed in Curtin Park, Port Curtis Junction by Rockhampton City Council. Presumably maintenance became an issue and in 1986 it was removed and stored at the Rockhampton City Council bus depot, prior to being sold in 1987 to an individual at Mt Etna in the Rockhampton district. A further change of ownership came in 1994 when the loco was auctioned and relocated to a private site near Echuca, Victoria. The North Eton Mill closed in 1988 after 100 years of operation, following merger with Farleigh, Racecourse, Marian and Cattle Creek Mills to form the Mackay Sugar Co-operative Association Limited. Glen Hall provides a good history of the North Eton Mill on his Mackay History website. I would appreciate the contribution of further updates or photographs for North Eton Mill No.1, either during its service career or more recent preservation years.